Over the past couple of years, there has emerged a veritable Replace Photoshop movement among artists and photographers, featuring image editors like Pixelmator, Acorn, Aperture and even Adobe’s own Lightroom. But the context was always qualified: It was primarily for people who used Photoshop but didn’t really have to — those who didn’t need its vast reservoir of capabilities or have to adhere to strict publishing standards. Photoshop is the standard and for creative pros in the publishing industry, so whatever rebellion was afoot went nowhere fast. 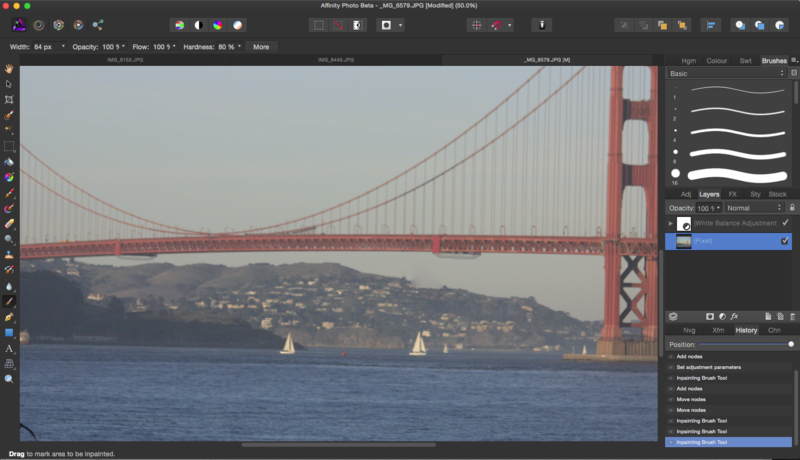 Serif is looking to change that with Affinity Photo, its new app that debuted in beta this week. It’s not often that we see brand new challengers to Adobe’s hegemony capable of meeting the master on its own turf. But Affinity Photo is setting itself up as a genuine Photoshop rival: a pro-level app with high-end features that are designed for professional environments. The overall interface is clean and uncluttered with all tools accessible by default. It’s not possible at this stage to test whether that claim is true, but I had a brief look at some of the vast array of features included in the public beta and I was impressed. Affinity is a broad, deep app with an abundance of professional tools. Built from scratch on a modern code base, the app was swift, responsive and surprisingly stable for a beta — it never crashed once. But there were frustrating moments too. The app’s inpainting feature functions like Photoshop’s content aware fill, and works well. 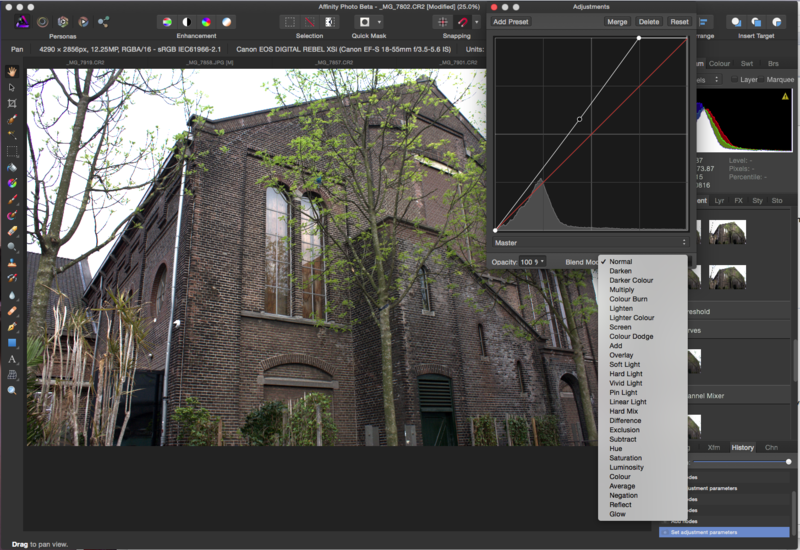 While Affinity Photo’s interface is reminiscent of Photoshop and incorporates some of the same core functionality, much of that resemblance is skin deep. It it is not Photoshop and does not pretend to be, but what’s good about having a somewhat familiar interface — dark with panels of tabbed tools — is that it’s easy to find functions you use, figure out how to use others and ascertain the difference between seemingly similar tools in both apps. The placement of certain tools is Photoshopesque, but the overall look and feel reminds me more more of Pixelmator, which is a positive thing. Affinity Photo’s colored icons are a feast to the eye, unlike the Apple-style monochrome that Adobe appears to have channeled from iPhoto and Aperture. The argument against multicolored icons is that they interfere with color perception. I’m not prepared to make a scientific argument, but I can say that color differentiated icons are easier for me to see and decipher. Photoshop has a larger variety of sharpen tools, but Clarity or Unsharp Mask can fill the bill most of the time. While you can view your image inside an application frame or in separate windows, as well as toggle the app on and off full screen, all of Affinity Photo’s modules are visible by default. There are a lot fewer of them than in Photoshop, making the app simpler to navigate. Affinity Photo has distinct Personas, modules that offer different tools for various design functions: Photo, Liquify, Develop (for Raw images), Macro (for recording actions) and Export. The closest analogy would be Photoshop’s workspaces, but this is not quite the same thing. The Liquify persona can give you some surreal warping effects. Photo Persona is the default space for the bulk of photo editing, cropping, selection, brushes, retouching, erasing and vector tools. The Liquify Persona offers a design environment for distorting images and applying special warping effects. The Develop Persona works for developing Raw images, giving you full control of color and tone. The Macro Persona lets you use macro presets, somewhat like Photoshop Actions, for automating common editing tasks or recording macros. The Export Persona lets you output images, layers or slices to a range of formats. You can’t fluidly switch between Personas in this beta, but the final version promises more flexibility. A selection in the current library of filters just happened to help this photo’s flawed white balance, but you can also record your own macro presets. 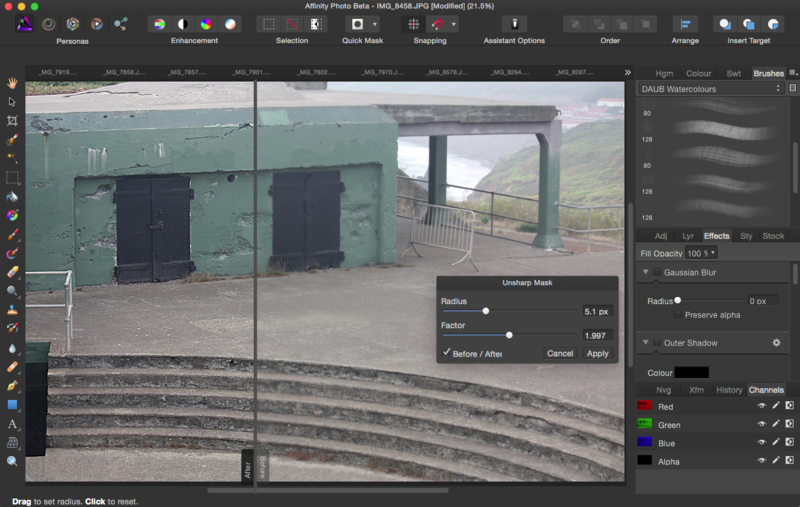 Where Affinity Photo has the greatest potential to shine — and to compete with its arch-rival — is its extensive photo retouching features both for standard formats and Raw. It has nearly all the major selection tools that Photoshop has and they work similarly. Photoshop users will also find familiar tools like adjustment layers, white balance and a slate of adjustable brush tools. 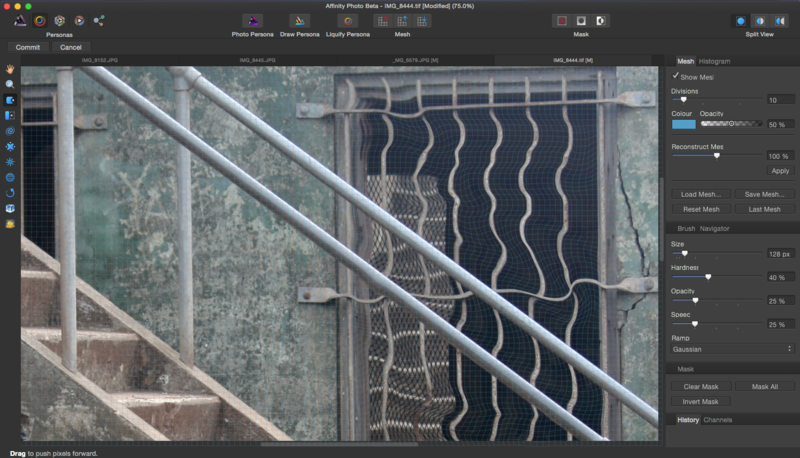 Moving through familiar blend modes, you can view the effect they’ll have on your image in real time. Refine edge functions lets you select difficult objects and hair. 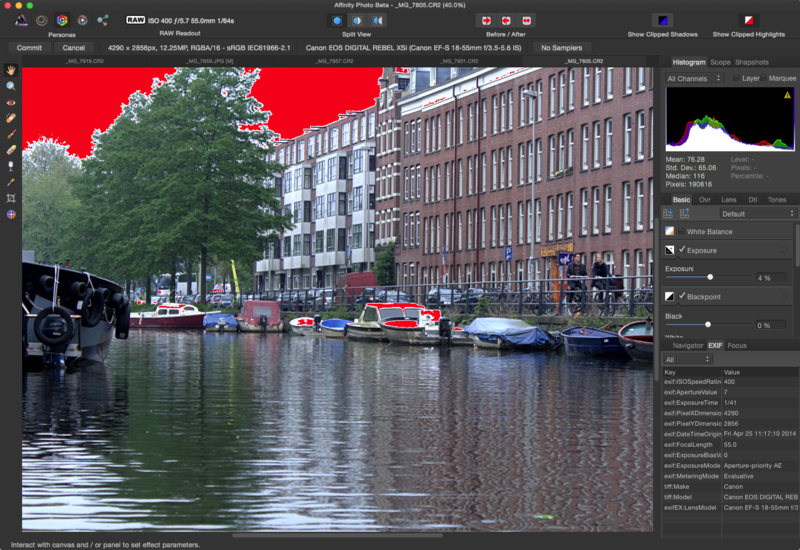 Content aware fill, an Adobe function, is recreated with Affinity’s Inpainting brush. There are plenty of familiar tools, but also some functions that Photoshop does not have. Unlike Photoshop, each adjustment offers between one and four choices, letting you immediately close in on the look you’re after. A real-time before and after slider is also unique to the new app in comparison to Photoshop. A handy slider-based history tool smoothly takes you back and forth to any point in editing time. 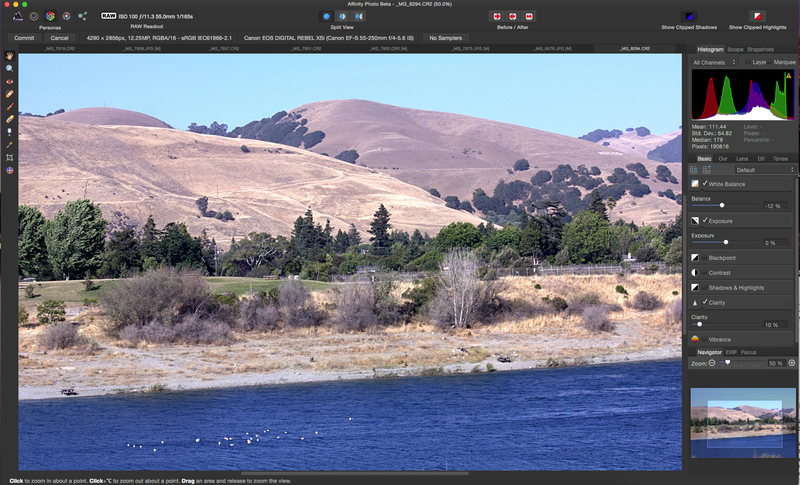 You can even Save with History, a non-destructive feature that lets you undo even after you’ve finished with an image. Some sliders, like the zoom, were a little abrupt and it was easier to punch in numbers than to try and get it correct visually. Clipped parts of the image are displayed, as in Photoshop. 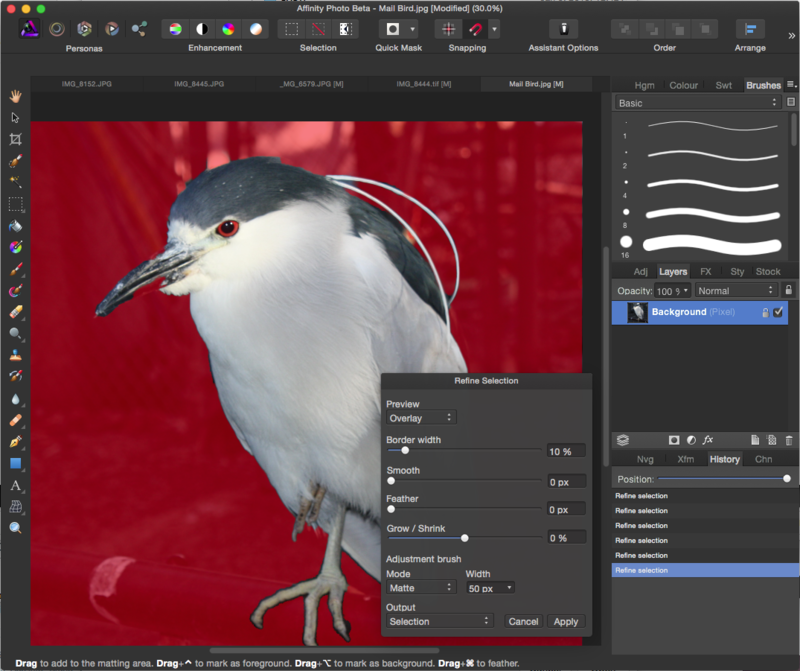 Adobe Photoshop has aged well and has incorporated many of the features its longtime user base has requested over the years. There are the inevitable complaints, of course, that the app is too vast and bloated, but Adobe developers have taken great pains to add specific customer-requested features. In addition, the Photoshop CC 2014 we see today is actually a rollup of two previous separate Photoshop versions — Photoshop Standard and Photoshop Extended — which creates a massive app with many built-in 3D tools and medical imaging capabilities derived from the higher end version. And unlike Affinity Photo, Photoshop has video and extensive 3D support, not to mention a completely analogous Windows version. 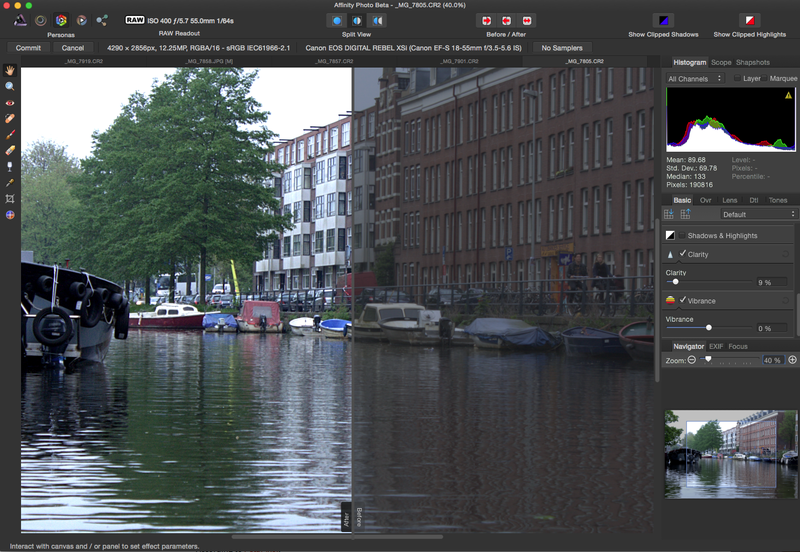 There’s the good ol’ Curves adjustment complete with dynamic blend modes. It’s also fair to say that because of a series of coding overhauls, Photoshop is pretty speedy and a good performer on modern Mac systems. The primary source of unhappiness is Adobe’s subscription model, which is not destined to change. That is something every Photoshop challenger, including Affinity Photo, is prepared to meet head on. It’s possible that as Affinity Photo proceeds with development, it could become a viable competitor to Photoshop; it certainly looks promising right now. If it supports the same formats and color spaces (it already supports the all-important CMYK) and is similarly compatible with other media and professional publishing environments, there’s no reason why it should not be able to compete in some professional circles. The price tag is also compelling. At $50, it compares favorably not only to Adobe’s subscription model (even the Photographer’s bundle at $10 per month) but also Adobe’s previous price of around $700 per license. There’s a very nice rendition of the Refine Edge tool. 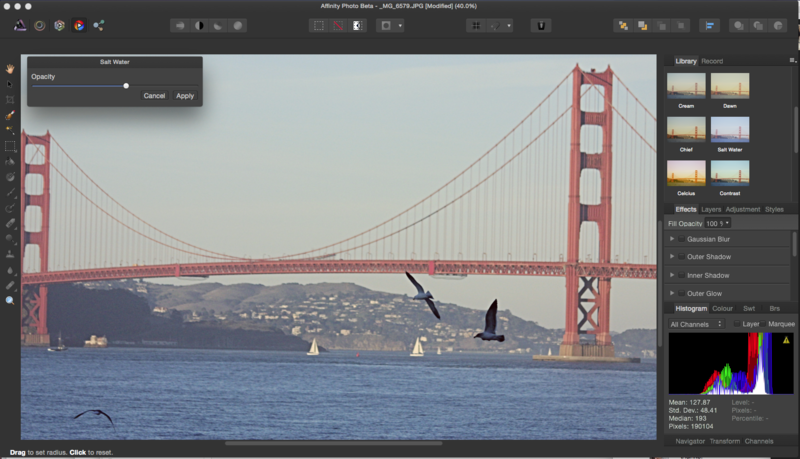 Affinity is further away in spirit from Aperture than Photoshop, as Aperture was originally created as a photo management tool and Affinity has no photo management features. Aperture was and remains a fine program (my choice for most editing functions, in addition to Photoshop) but Photoshop also has Bridge and Aperture’s competitor Lightroom to take care of management functions. You can go ahead and download the beta for yourself; be sure to let Serif know what you think.